Mankind has an irresistible need to explore unknown territories. For this purpose new technologies have been developed which stretch from better sailing ships to spacecrafts. Even today, missions are on underway to learn more about Mercury and Saturn. The successful landing of the Huygens satellite on Titan is one of the most recent examples. Nevertheless, Terra Incognita remains very close, right under our feet. By mining and drilling mankind has drilled to only 13 km into the interior of our own planet, a mere fraction of the distance to the centre of the Earth. Early on in the 20th century the knowledge on the interior of our planet advanced by the analysis of the reflection and absorption of seismic waves produced in earthquakes. This analysis has led to the present image of an onion like structure with a solid inner core, a liquid outer core and a mantle on which a crust is present. It inspired Jules Verne to write his famous book on a journey to the centre of the Earth. The Earth does not only receive energy from the Sun, but itself also produces heat. The total heat flow through the surface is 45 TW= 45 million MW. This is a small amount compared to the heat reaching us from the Sun, but is larger than the heat produced by all power plants installed on the globe. The heat is not evenly distributed over the surface as is shown in the figure. The high heat flows occur at the mid-oceanic ridges while the low flows are found on the continents. It is estimated that about half of the heat is produced in radiogenic processes: i.e. radioactive decay of natural radionuclides or possibly even natural nuclear reactors (see below). The interior of the Earth plays an important role for life at its surface. Although the atmosphere of our planet protects us from a lethal dose of cosmic radiation, the Earth’s magnetic field protects it from being eroded away, Earthquakes and volcanic eruptions are often the consequence of the drift of the continents. Nowadays some scientists even relate the uneven internal heat flow at the Earth's surface to El Ni�o and its related impact on weather systems. These phenomena raise the questions of where the internal heat of the Earth is generated, by what mechanism and how diffuse these heat sources are. Hypotheses on the internal structure are hard to verify and are often invoked to explain certain aspects of it. Most hypotheses consider a more or less spherically symmetric structure and ignore possible local concentrations. 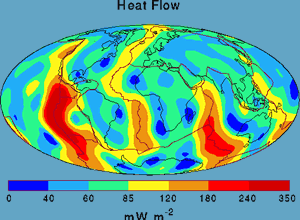 The global surface heat flow, however, ranges over more than an order of magnitude. Is that an indication for energy clustering? And if so, how large are such clusters, where are they located and do they influence the motion in the liquid core which is responsible for the geomagnetic field? There is more or less consensus that at least half of the heat is generated by radioactivity. For most scientists this means the decay of the naturally occurring radionuclides. A decade ago, however, it was proposed that at the centre of the Earth there is a nuclear breeder reactor roughly 8 km in diameter. Is it possible to prove or disprove these hypotheses? In 2008 we published a paper in which the feasibility and consequences of nuclear georeactors in the Earth’s core-mantle boundary (CMB) were investigated. The conclusion is that such georeactors in the CMB are feasible and that there is supporting evidence for them. (see P. Ball, Are there nuclear reactors at Earth's core? Nature News, (2008) doi:10.1038/news.2008.822. and R.J. de Meijer, and W. van Westrenen, The feasibility and implications of nuclear georeactors in Earth’s core-mantle boundary region, South African Journal of Science, 104, (2008), 111-118.